since this is my first post here I kindly salute you all. me on google but without results for what I want. I mention I never worked with arduino before and I repair electronic devices. I just need to help me with a code and a pinout connection for a thermometer. A friend of mine has saw it to a guy and now he wants something identical. Raspberry 128x32 weiss). By this title is on ebay. I just need to show me the temperature in Celsius. A friend of mine has made a code for me but somehow is not good because is not uploading in arduino. and which pins are for connecting the sensor and the LCD? I also atach here the ino file made by my friend and maybe someone can edit it were is wrong. Thank you very much and again please to move this post in the correct thread if here is not OK.
What problems are you having with that code? If you want other people to compile the code, you need to post links to the libraries you are using. "live" if I can say so. arduino for RT Weller tips but there were all the info's. And it was an Arduino Uno. When he helped me with the code, I didn't had the arduino nano with me. -it is installed on com35 and detected as "usb-serial ch340"
SN: Upload any sketch to obtain it". As I remember, the installed libraries are for my modules that I want use them. If I know something about libraries, I was posted. 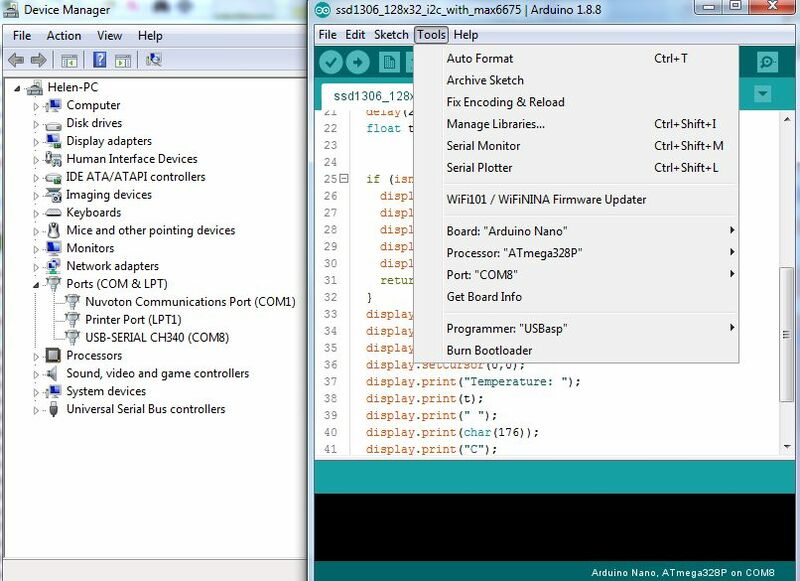 "Arduino: 1.8.8 (Windows 7), Board: "Arduino Nano, ATmega328P"
Sketch uses 14678 bytes (47%) of program storage space. Maximum is 30720 bytes. Global variables use 391 bytes (19%) of dynamic memory, leaving 1657 bytes for local variables. Maximum is 2048 bytes. option enabled in File -> Preferences." That looks like it is not plugged in or you selected the wrong Port on the Tools menu. Might it be a problem with the driver? I've double checked and everything is installed ok.